Why Worry About My Crawl Space? Does your home have any of these common crawl space symptoms? Higher heating and cooling costs? Wet and/or contaminated insulation in your floor joists? 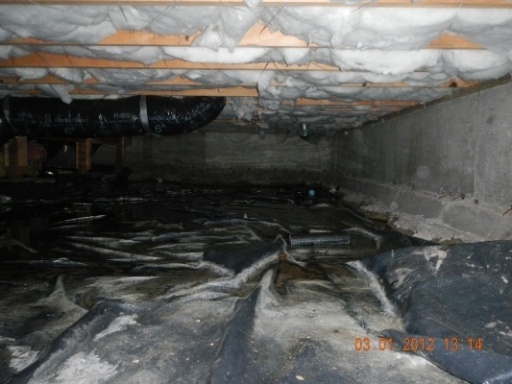 This is a typical Tacoma area crawl space with an old ineffective vapor barrier. Notice the hanging insulation, a favorite nesting area for rodents. Moisture from the dirt floor has also reached the insulation decreasing its effectiveness and causing a musty odor throughout the crawl space area. Below is the same Tacoma area crawl space after being fully reconditioned. The vapor barrier is a 10 mil product that is virtually puncture resistant. The entire area has been cleaned and sealed so moisture can no longer damage the wood or the insulation. The result is a clean, moisture free environment that will protect your home year after year, not to mention it looks great too. 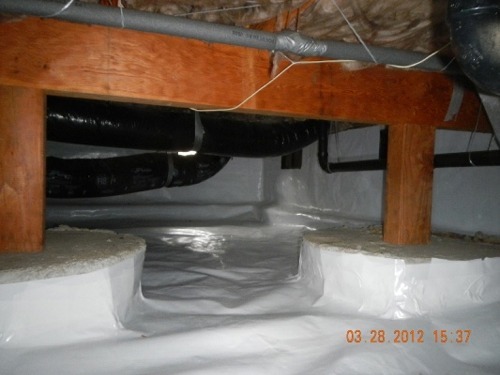 Call (253) 691-9239 or Contact Us for a free consultation about your crawlspace needs. Serving Tacoma, Gig Harbor, Bremerton, Silverdale, University Place, Federal Way and Puyallup, WA. The area under your home is probably the least visited part of your home, definitely the most neglected and yet it has a significant impact on the health of your home and the quality of the air you breathe inside your home. In the past the crawl space was not even considered a part of the home. Unfortunately yesterdays crawl spaces probably had way too much in common with a tropical jungle providing a five star hotel for pests, molds and mildew. Today we know that your crawl space has a direct impact on preserving your home, improving the quality of the air in your home while also increasing energy efficiency. The crawl space needs to be seen as part of the building as a whole. If there is high humidity and musty odors downstairs it will also affect the upstairs environment as well. Some builders say that up to 30% of the air we breathe in the first floor comes directly from your crawl space. This is particularly true when it comes to older more leaky homes. Our web site is very informative and we invite you to take a stroll and educate yourself to find out why there really is difference in crawl space contractors. Finding a service company today that actually delivers on their promises can seem like a daunting task. At Crawl Space Solutions we deliver on our promises and we back that up with a five year warranty on our workmanship and materials. If you are considering selling your home this is a transferable warranty. In addition most of the vapor barriers we install are guaranteed not to tear for life. We’re that confident in the materials we use. 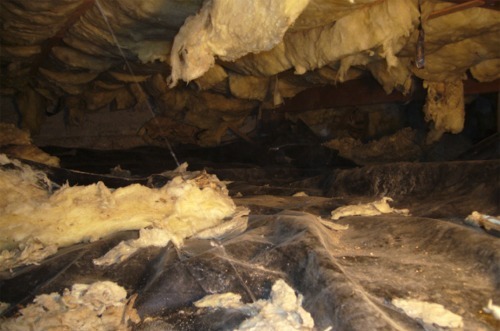 We are a local company that specializes only in solving these kinds of crawl space symptoms. We are in the business of turning your old musty contaminated crawl space into a clean, beautiful and healthy environment. We can solve all your crawl space needs. If your home has a neglected crawl space then don’t feel alone. We understand and more importantly we know how to fix your crawl space problems. Whether your crawl has been infested with rodents, has old ineffective insulation, suffers from water and drainage problems or just has an old musty smell that has made its way inside your home we have the solutions. Provide us with some brief information about your job, and we'll get back to you right away. What is the purpose of installing a Vapor Barrier? We’re blessed in northwest to have such a mild climate and to almost never have a shortage of water.